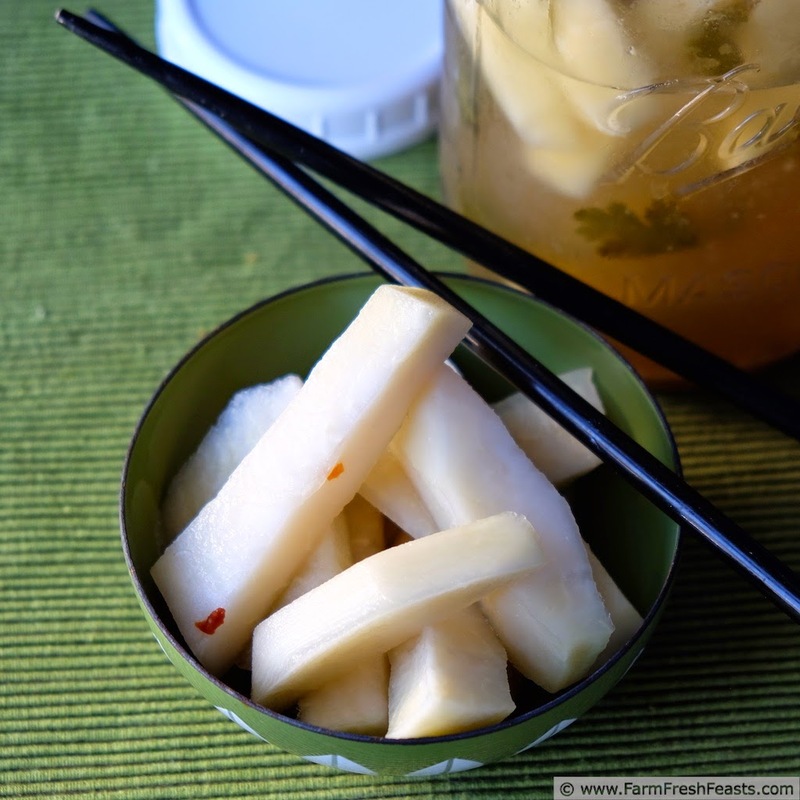 Spicy, tangy, crunchy and zippy, these quick pickled kohlrabi spears wake up your appetite. Oh my goodness. These pickles. The flavors that are bouncing around my mouth right now. I am clearly a pickle person. I mean, on our near weekly trips out for burgers and fries I always ask for pickles on my burger [interestingly, pickles are one of the 3 condiments the whole family chooses--onions and mustard being the other two]. 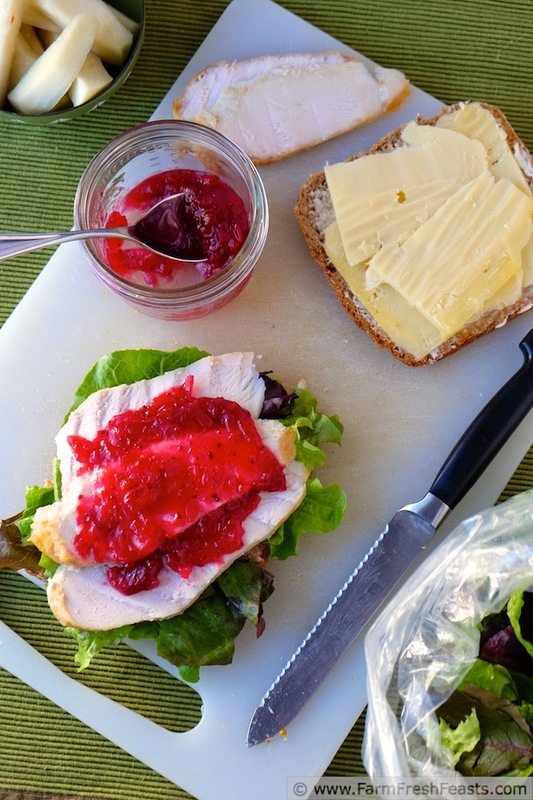 I like pickles on sandwiches, including pickled turnips on My Favorite Grilled Cheese Sandwich. I would never suspect that I could create a gourmet pickle, though, especially after my pickled yellow squash failure-turned-successful-sliders? However, the layers of flavor that rocket through my mouth as I bite into one of these pickles--spicy, crunchy, tangy, zingy--remind me of the layers of flavor bouncing around my mouth when I eat Ma Po Tofu from Great Wall Chinese Restaurant on Logan Circle in Washington DC. So many flavors to experience in that dish! I received a monstrous, alien, gigantic kohlrabi in our Community Supported Agriculture (CSA) farm share. No kidding, no camera tricks--those are pint jars and it's bigger than the pair of them together [thanks again Carole for the jars]. I decided to pickle it primarily because I had my canning pot set up from making Cranberry Salsa and also because there was enough peeled kohlrabi sticks for me to compare pickling methods for making kosher dill kohlrabi spears. 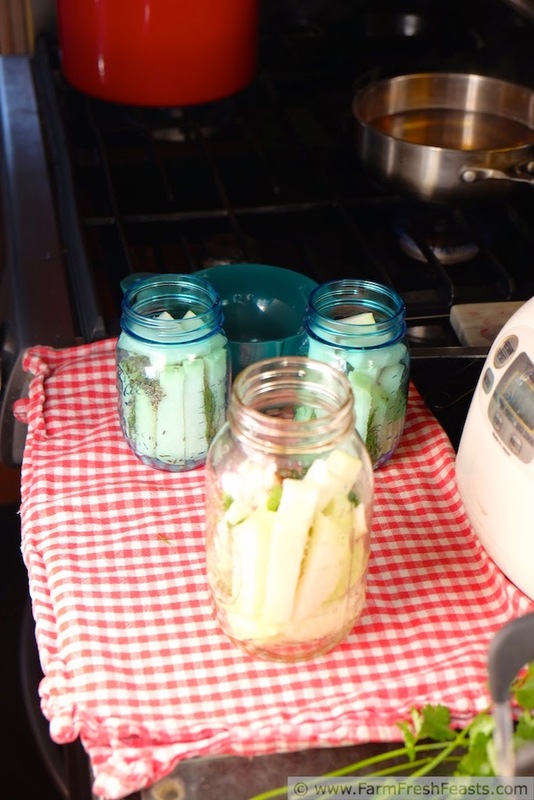 [Dueling Kohlrabi Dills will be another post, after the 3 week brine time we'll crack open both the jar from the pantry and the jar from the fridge and check 'em out.] 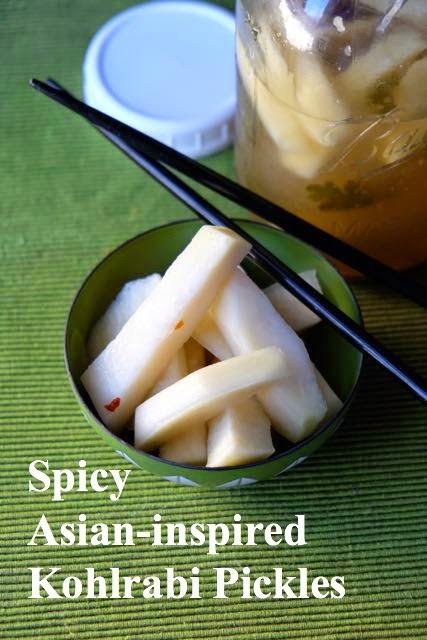 First I need to share these Spicy Asian-inspired Kohlrabi Pickle Spears--an easy refrigerator pickle. After I filled up the pint jars for the Dueling Dills, I still had a lot of kohlrabi left over. 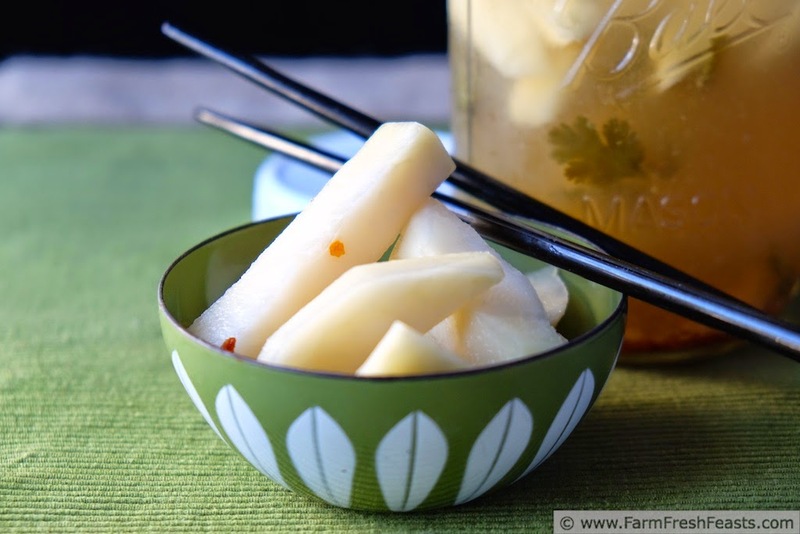 I poked around on my favorite canning blog, Food In Jars, and found Marisa's recipe for Asian-inspired Refrigerator Pickles. I decided to adapt it using what I had on hand. 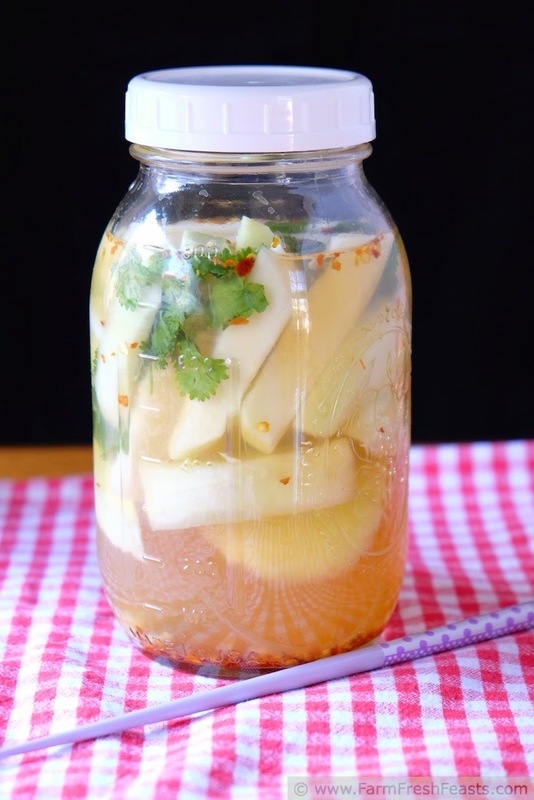 Specifically, I swapped in kohlrabi for the cucumber, crushed red pepper for a chili pepper, star anise instead of scallions, cilantro instead of mint, and a standard apple cider brine that I boiled before pouring into the jar. After I got everything pickled, I put all the jars away and forgot about them. Until Saturday. I was feeling peckish mid-morning and poked my head in the fridge looking for a snack. I spied the pickle jars. Since I'd mentally pencilled in Thanksgiving as the Dueling Dill Pickle Off, I chose the jar of Spicy Asian-inspired Kohlrabi Spears. I ate one. Whoa. Party in my mouth. I had another. The party continues. I travelled around the house sharing pickles with my spouse reading in the living room and the kids watching TV in the basement. My daughter thinks these pickles are too spicy, but the rest of us approve. 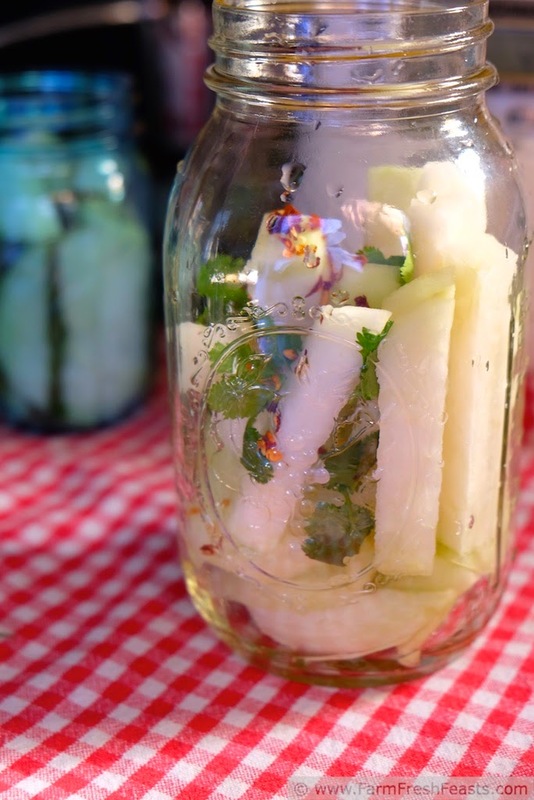 If you've got a freakishly huge kohlrabi--consider whipping up a jar of these pickles. Your mouth will thank you. 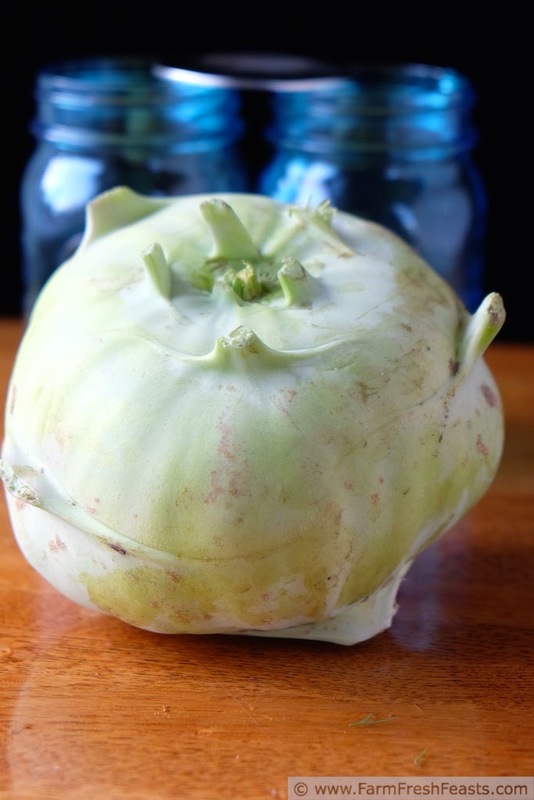 For other recipes using kohlrabi, please see my Kohlrabi Recipe Collection, part of the Visual Recipe Index by Ingredient, a resource for folks like me eating from the farm share, the farmer's market, and garden bounty. I've got more ideas on my Pinterest boards. Want to know how to use this blog? Click here. The canning pot is ready to go, the pickle jars are packed--I'm just waiting on the brine to boil. Pack kohlrabi into jar. Tuck star anise, cilantro, garlic and pepper into available crevices. Pour lime juice over kohlrabi. Fill to top with brine (for me that was about 1½ cups). Screw on a lid (I use these Ball Mason Jar Plastic Storage Caps--Amazon Affiliate link) Refrigerate at least 24 hours before tasting. These can hang out for several weeks in the fridge. Combine all ingredients in a sauce pan. Set over medium heat and bring to a boil. Remove from heat, and pour brine over packed jar. I have tried kohlrabi all of once in my life, raw in a salad, and I hated it, despite very much wanting to like it. I'll have to try pickling like this, I'm definitely intrigued! I think I may consider you lucky for not being overwhelmed with kohlrabi from the farm share each spring and fall. Then again, I think I'd also consider it sad that you hadn't experienced the amazing flavors that kohlrabi can bring to both sushi and pickles. If you get your mittens on a kohlrabi, give this a try and let me know how you like it! I'm so glad to have recipes to share. Thanks for hosting! I'm not even kidding. I too, received a monstrous, alien, gigantic kohlrabi in my CSA. Earlier this summer, and I made fritters. Lots and lots of fritters. Must have been a great year for kohlrabi in Ohio. Rock on with your mouth party. I've got 2 of the aliens in the fridge right now. Ack! However, I will say that the dill pickles, at least the refrigerator dill ones, are amazing so I think I'm going to make more pickles.